G Corp International is an Australian supplier of laser systems and CNC routers for the mining industry. Founded in 1992, the company supplies CNC routing technologies, IPG fibre laser cutting and marking solutions and CO2 cutting and engraving laser systems to companies in Australia, New Zealand and the Asia Pacific rim. We pride ourselves in the technical knowledge of our staff, and are committed to providing excellent customer service. G Corp International also supplies commercial air purifiers and offers alignment, installation and repair services as required. G Corp supplies a large selection of cutting and engraving machines, which vary in size and power consumption. These are manufactured by leading laser machinery manufacturer GCC, and include more than ten different machines from the LaserPro series. The company stocks a selection of metal marking and carving systems, for full-depth metal and plastic marking. These can be used to mark heavy machinery and equipment, and are able to mark with very high precision, making them particularly useful for marking small objects such as keys. G Corp supplies both portable and non-portable metal marking systems. 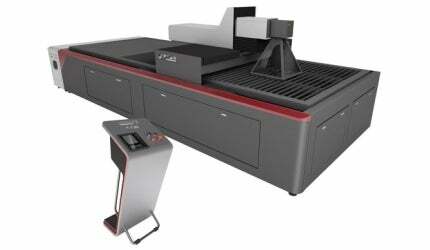 We stock a selection of CO2 laser machines, which are designed for cutting and engraving. These include machines with high precision, enabling the cutting of detailed and unusual shapes. We also stock customisable machines with extension slots and machines with built-in chillers and extractor fans. In addition to this, we supply a large selection of CO2 cutting-only machines, which come in a wide range of size capabilities. These include hybrid metal / non-metal cutters, machines with very user-friendly interfaces and systems with water cooling capabilities. For very fast engraving, we supply the galvo/linear laser system, which uses a galvometer head to engrave a 2,400mm x 1,200mm area in less than 40 minutes. This system is ideal for all forms on non-metal, including board, timber and acrylic. G Corp supplies a selection of CNC routers manufactured by Chinese company Limac, which are designed to work with almost any CAD/CAM software. These are ideal for signage and plastics production, and are designed to be very durable, accurate and reliable. All Limac machines come with a one year onsite warranty. We also stock commercial air cleaners and purifiers manufactured in Australia by EnvironAir. These are designed to remove chemicals and solvents, as well as fine dust. These filters come in a range of sizes to suit different production environments, ranging from 32kg up to 59.5kg. All EnvironAir systems come with a three-year warranty. In addition to stocking a large selection of laser systems and CNC routers, we also provide extensive alignment, repair, installation and maintenance services for all our equipment. Our highly qualified technicians can visit you onsite, typically within 24 hours, and we operate a ticketing system to ensure no aspect of a job is ignored. Where appropriate, we also offer remote support either online or by phone. Providing quality customer service is very important to us, which is why we ensure all of our staff are factory-trained so that they have enough expertise to help you with any questions or issues you may have. As part of our service we offer remote or face-to-face training, as well as lifetime product support. If you would like to know more about G Corp’s products and services, please contact us using the form or details below. Sign Technologies Australia services and supports the sign, engraving and graphics, engineering and mining industries of Australia.